Paradis Express was selected as the winner in MIPIM’s “Best Futura Project Award” category in 2016. Image: © Jaspers-Eyers Architects. Paradis Express is a proposed eco-neighbourhood for Liège, Belgium. Image: © Jaspers-Eyers Architects. The development has been designed by Jaspers-Eyers Architects, A2M and BAG. Image: © Jaspers-Eyers Architects. Exhibiting a passive design, the development has received a positive rating from BREEAM. Image: © Jaspers-Eyers Architects. Spread across 38,417m², the project will include residential units, office space and additional retail and service areas. Image: © Jaspers-Eyers Architects. 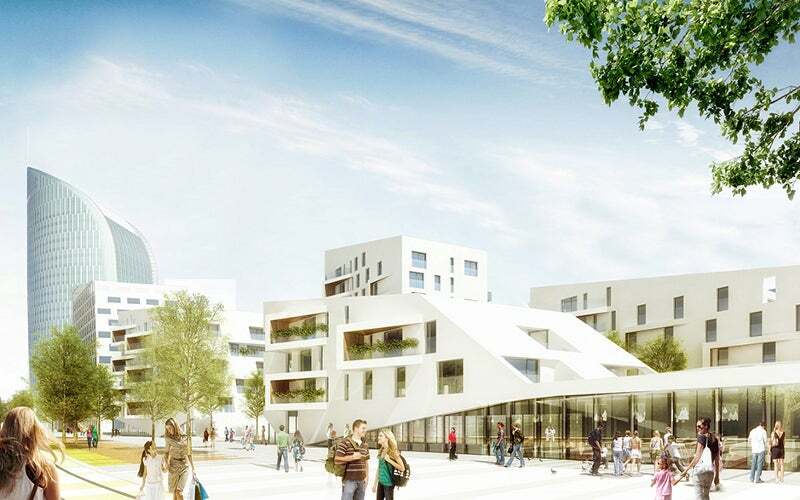 A design proposal for an eco-friendly neighbourhood in Liège, Belgium, has won a competition for a mixed-use real-estate project. Dubbed ‘Paradis Express’, the project is being developed by Fedimmo, in consultation with the City of Liège and the Walloon Region. In March 2016, the mixed-use project won the ‘Best Futura Project Award’ at the MIPIM Awards. The design was proposed by Jaspers-Eyers Architects, A2M and BAG, and has been hailed for its sustainability and efficiency, as well as a collaborative approach involving the public authorities and the developer. A plot opposite the Guillemins station will accommodate residential units, office space, additional retail and service areas, and a landscaped promenade. The project has been conceived as an urban link between the landmark Gare de Liège-Guillemins railway station and the Meuse River bank. It will be accompanied by the 118m-high Tour Paradis tower, also developed by Fedimmo and designed by Jaspers-Eyers Architects and BAG. The design focuses on creating an urban green space accommodating the city’s skyline. The need for a two-fold approach arises from the city’s topography and the height variation of its buildings. Buildings will be located at different angles to provide unrestricted views, and create an inner block that establishes open spaces at the corners of the development. A square and a forum between the buildings are designed to facilitate a connection between the bank and the Guillemins train station. The design varies the height of its buildings gradually to maintain Liège’s skyline. The site’s open aspect, offering broad views, good accessibility and continuity with the public space, is particularly well suited to its environment. Paradis Express features a passive design and secured a ‘very good’ rating from the Building Research Establishment Environmental Assessment Methodology (BREEAM). The climate-friendly design will save the project approximately €220,000 a year in energy costs, and will also reduce its carbon footprint by 600t of CO² a year. The buildings have been designed to adhere to the near-zero energy concept, and positioned to optimise natural lighting. Rooms within the buildings will face southeast to manage the amount of daylight received. The average daylight factor for the project varies between 4% and 6%, whereas the BREEAM requires 1.5%. The project will also include reinforced insulation, exterior protection and an active cooling system, along with water and waste management systems. The project’s rolling green and tree-lined urban park draws inspiration from the city’s hills and valleys. Spaces between the buildings are also linked by greenery in between them. Vegetation lines are introduced into the landscape to further highlight green areas, with rows of trees arranged in small groups to portray spontaneous and natural distribution. This arrangement permits unrestricted views of the neighbourhood, while offering more open spaces with benches under the trees. "The site’s open aspect, offering broad views, good accessibility and continuity with the public space, is particularly well suited to its environment." The mixed-use development will be built on 38,417m² of gross building area, comprising 160 residential units, 350m² shops, 750m² services and 21,000m² office spaces. It will also offer approximately 370 parking spaces in the basement, as well as 1,500m² of additional area. A number of communal facilities will be developed, including an educational garden / shed, solarium, library, playground and ecological utility room. Commercial developments will include a restaurant, shops, cafes and a covered market area. The development will be well-connected with easy access to buses and trams, bike parking and recharging terminals. Bureau Lemaire has been appointed as the structural engineer for the project. TPF Engineering will provide technical building services, while acoustic services will be rendered by D2S. Landscaping will be carried out by Heinz Winters and Atelier Paysage. A collaboration of Duchêne, Galère and Interbuild will be the general contractor for the project. Munters is a global leader in energy-efficient air treatment solutions for comfort, process and environmental protection. Our air conditioning systems are designed to control all your ventilation needs, contributing to quick installation, high indoor comfort and low life-cycle costs.